The MicroView. Such a cool concept! 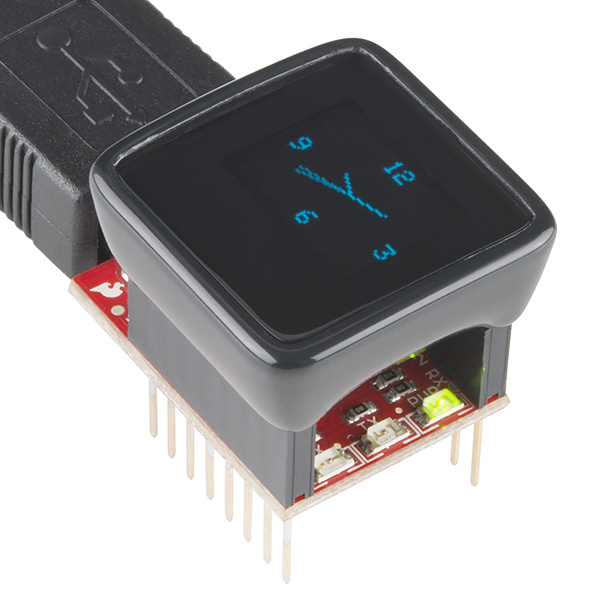 An Arduino, with a built-in display, fully enclosed in a beautiful, ergonomic case. 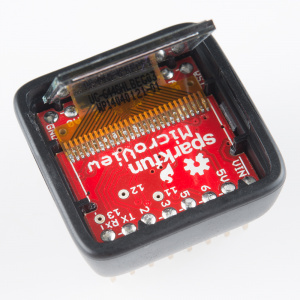 Use it to create small video games, wearable electronics, or to simply explore electronics and programming. But as cool as the MicroView is, if you can't reprogram it, it's not much more than an annoyingly repetitive demo. In August 2014, we (unknowingly at the time) sent out nearly 2000 MicroViews without bootloaders. Void of a bootloader, the MicroView is essentially un-programmable -- that exciting Arduino platform becomes a glorified paperweight. A bootloader is a small piece of firmware, living inside a microcontroller's memory, which can write to the remaining program memory of that microcontroller. Bootloaders usually allow for easier, less expensive means for updating the program memory on a processor. Instead of specialized tools to program the device, more generic, commonly available components can be used. One of the reasons Arduinos, like the MicroView, are so popular is because they all have a serial bootloader built into them. Instead of using an external piece of specialized hardware – in this case an AVR ISP (in-system programmer) – to program the processor, a more commonly available serial port can be used. In the case of the MicroView, that's the MicroView USB Programmer, which converts the ubiquitously available USB to serial. If you've received a defective unit, first of all: we're so sorry! We're shipping replacements as fast as we can build them, you'll be getting one soon. In the mean time, this is a great opportunity to learn a new skill. In this tutorial, we'll walk you through every step involved in loading a bootloader onto the MicroView: disassembling the enclosure, wiring up an assortment of programmers in a variety of ways, programming the bootloader, and testing it out. Before you get going, there are a few tools you'll need to gather: something to pry open the MicroView, a method for connecting to the small vias, and an AVR programmer. There are many options for each of those tools, we'll list a few in the sections below. For those short on one tool or another, we've created the MicroView Bootloading Kit, which includes everything you'll need to follow along with this tutorial. 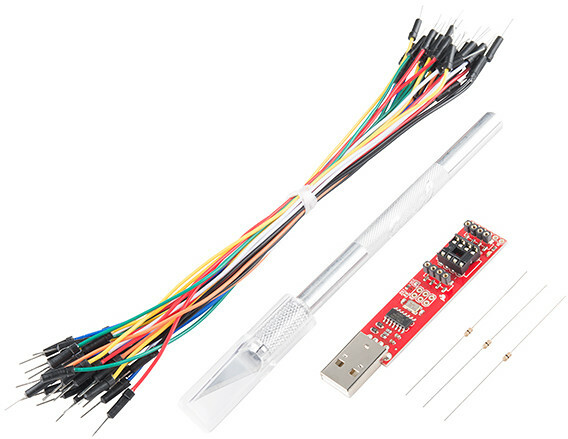 The kit is an especially great deal if you need an AVR programmer -- the price for the kit (which includes a knife, jumpers, and resistors) is the same as the programmer itself. A thin, flat, rigid-ish tool is required to separate the MicroView's shell from the lens covering it. This can be a spudger, hobby knife, or a thin flathead screwdriver (the smallest bit in our Pocket Screwdriver works). The knife has a lower potential for scratching your MicroView's shell, but the tip will also probably break on your first pry attempt. Use a more veteran, dulled blade if you can. Or, better yet, sacrifice a blade and break the sharp end of the tip off. There are a multitude of tools that can perform the task of reprogramming a MicroView over ISP. There are boards built for the task, like the Tiny AVR Programmer, STK500 USB Programmer, or the AVR Pocket Programmer. Even if you don't have a dedicated AVR programmer, you might have a programmer and not even know it! Most Arduino's can be programmed to replicate an AVR Programmer. If you have an Arduino Uno, RedBoard, Pro, or, really, any ATmega328P-based Arduino, you're already good-to-go. By loading the ArduinoISP sketch onto your Arduino, it'll transform into a USB AVR programmer. Arduinos programming Arduinos: madness! To connect between your Programmer and the MicroView, you'll need six, individual male-to-male jumper wires. Most M/M jumpers will do, including the standard or premium sets. You can even use solid-core wire if you'd like. There are a handful of software tools that can be used to reprogram AVRs. The easiest program, and the one we recommend, is the good ol' Arduino IDE. 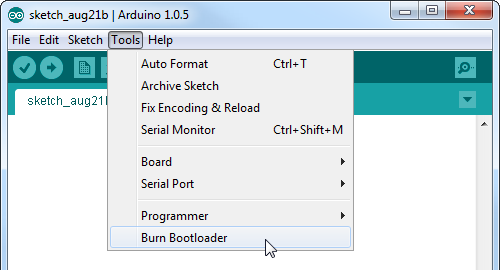 Arduino has a built-in tool, which allows you to burn a bootloader into any of its many boards, it makes programming a bootloader as easy as two clicks. The hardest part of this whole process is connecting your programmer to three of the MicroView's tiny ISP pins. Due to space restrictions they're broken out to a trio of small, exposed vias. After lifting the cover off your MicroView, you'll need to connect to those vias labeled "11", "12", and "13". If you apply enough steady pressure, you can complete those three connections without soldering or connecting anything else. Be warned, though, that it'll take a few tries to get right; if you're low on patience, frustration might brew. If you'd like to avoid soldering to your MicroView, one trick is to plug through-hole, 0Ω (or, at least, very low resistance) resistors into the MicroView's three ISP vias. The trick is finding resistors with thin enough leads. The 0Ω resistors on our Resistor Kit work perfectly for this task, but watch out, many other resistors -- especially those rated for ¼W and above -- have too-thick leads. Instead of jamming resistors into the vias, if you have soldering tools handy, you can make the programming process a lot smoother by temporarily soldering a jumper wire to the test pin -- creating a reliable electrical connection between MicroView and programmer. A simple iron, and some solder is all you should need. Solder wick might help when you get to disconnecting the wires and cleaning up. Before we trip into the rabbit hole, we should at least make sure your MicroView is actually missing its bootloader. If you haven't already, follow along with the MicroView Getting Started Guide. That will walk you through driver installation, and plugging in the MicroView.